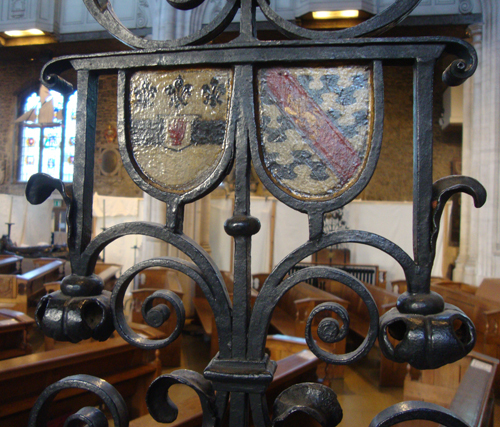 Yesterday I finally got to visit this ancient church, the oldest in the City of London, and one which survived both the Great Fire and (just), the Blitz. 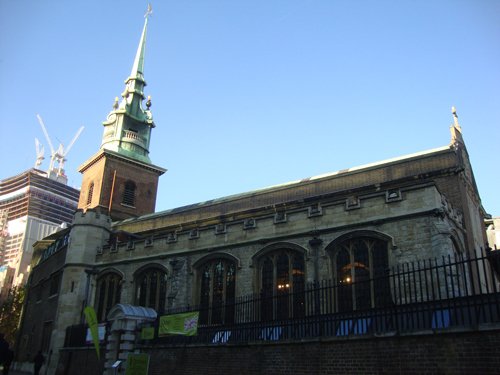 All Hallows by the Tower was founded in 675, a good 400 years before the eponymous Tower itself. There are a few remains of the original Saxon building in the form of an arch, but older still are parts of a floor from a Roman dwelling which can be seen in the crypt. Today the crypt houses an excellent small museum, one of whose many artefacts includes a crow’s nest from Ernest Shackleton’s ship “Quest”. 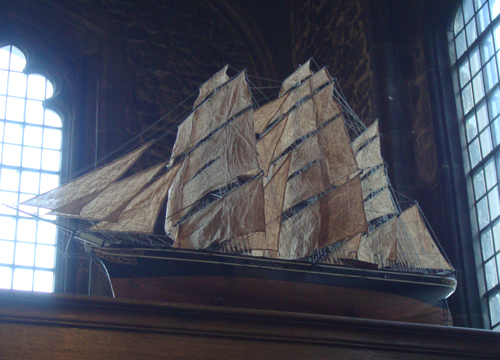 The church is very much associated with sailors, Merchant Navy and Royal Navy alike: there are ships’ models and memorials scattered around the building. 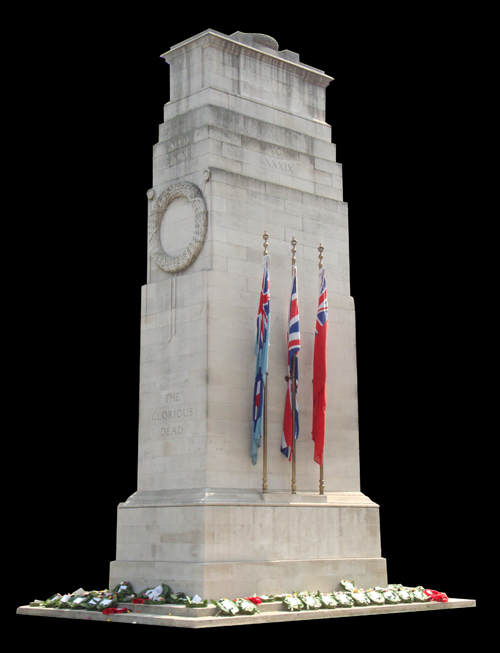 It’s no coincidence that the Merchant Navy war memorial is just across the road. Most of the post-Blitz surviving parts of the church are mid-17C. Samuel Pepys observed the Fire from what would have been the very new bell tower. In fact, All Hallows survived the conflagration thanks to firebreaks having been made around it. Proximity to the Tower inevitably means All Hallows has close associations with executed martyrs, whose heads were delivered there for burial. 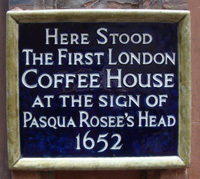 Noteworthies include Thomas More (1535), St. John Fisher (1535) and William Laud (1650). 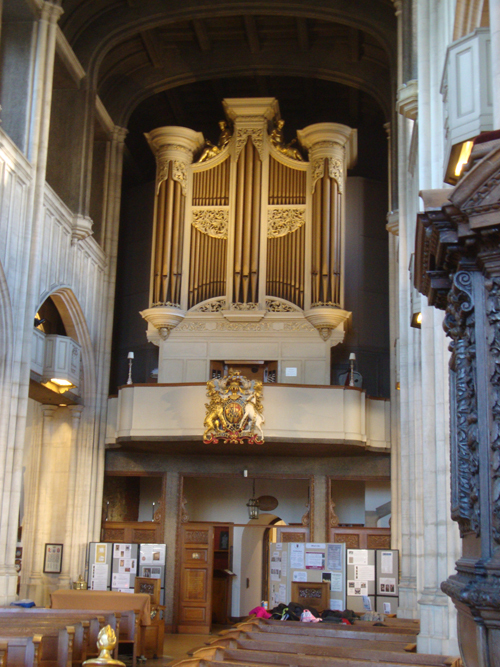 The church has very close ties to the USA owing to William Penn having been baptised there in 1644 and John Quincy Adams’s marriage there in 1797. So a massive store of history. 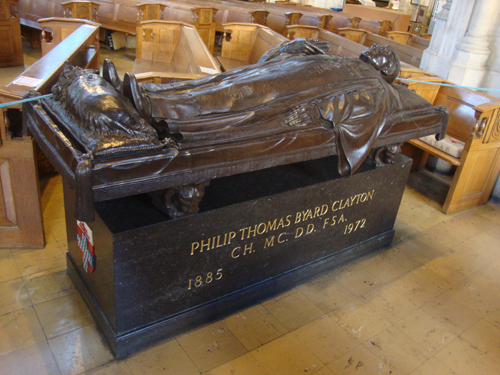 Yet, I found myself most taken by a more recent tale, the inspiring story of Philip “Tubby” Clayton (1885 – 1972). Do you perhaps remember your parents, when describing a stupid person, to say: “as dim as a Toc H lamp”? I know mine did. Well, it all started with Tubby. 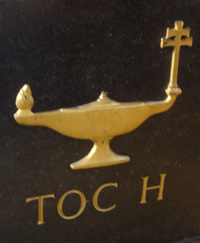 As an army chaplain in World War One, he founded what became the Toc H movement. It was a Christian friendship association for the soldiers, begun in a building behind the lines where they could fraternise and use the library which Tubby set up. To prevent the theft of books, he instituted a system whereby the soldiers had to leave their hat as collateral. After the war, he continued to develop Toc H, but was also the Vicar of All Hallows for some 40 years. He suffered the destruction of his church by the Luftwaffe but it must have been most uplifting to witness its restoration in the following decades. 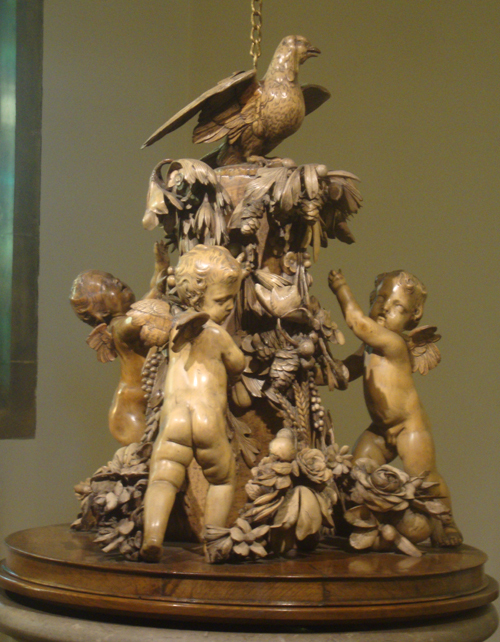 Did I mention the gorgeous Grinling Gibbons font cover in the Baptistery? 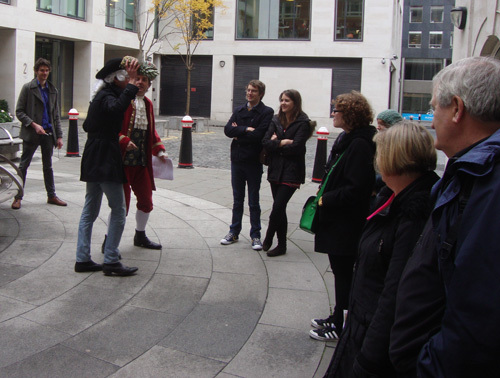 All Hallows by the Tower is welcomes visitors seven days a week. Check their website for opening times. 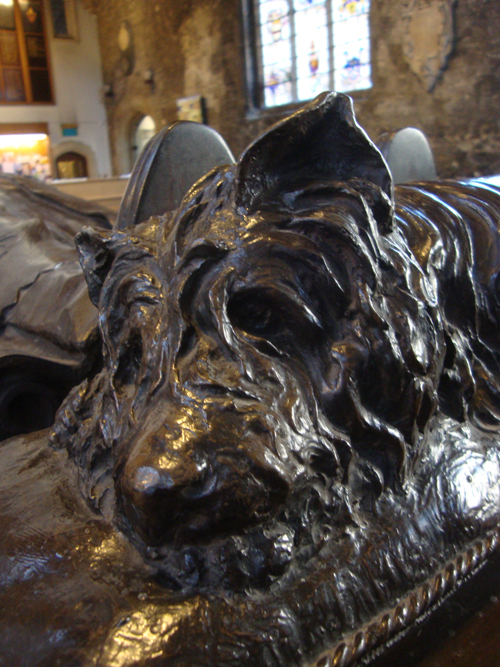 … but how cute is the wee dog at his feet? 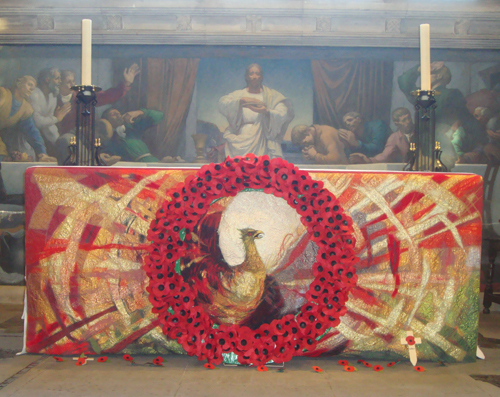 All Hallows commemorates British seafarers down the ages. If you take your sword to church, you might make use of this 18C sword holder. Very rare in churches nowadays, All Hallows has three of them. 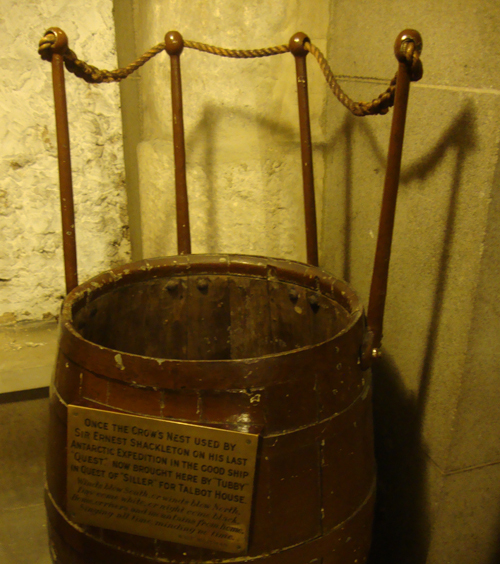 Crypt Museum: Shackleton crow’s nest. 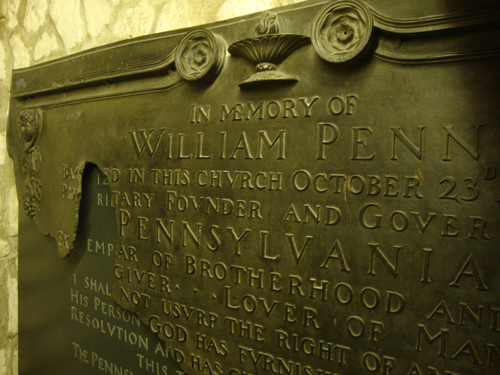 Crypt Museum: Bomb-damaged memorial to William Penn. 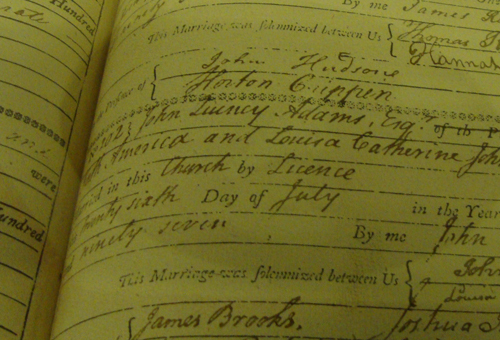 Crypt Museum: Recording of the marriage of John Quincy Adams. 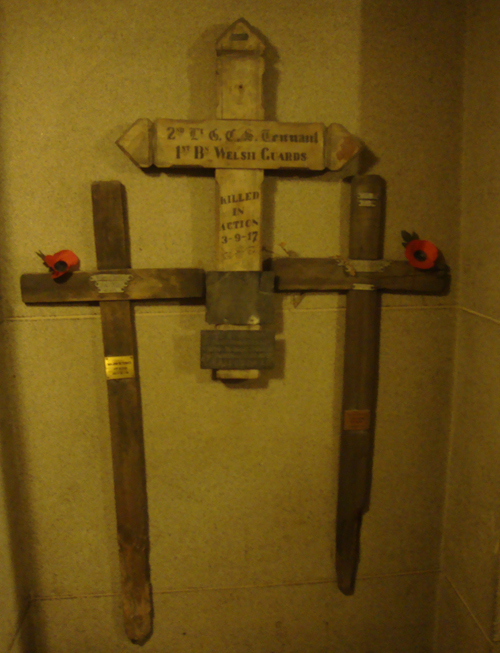 Temporary grave markers recovered from World War One battlefields. 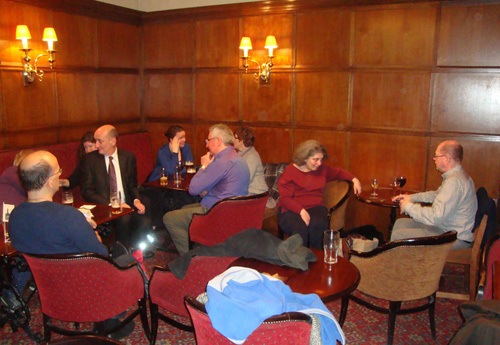 A guest post by Gareth Edwards, editor of London Reconnections. Green or Holden? It’s a tricky question. It’s hard to dispute that in strictly design terms Holden’s stations are superior, but I genuinely believe that Green deserves more praise than Holden for his work, which I know isn’t a popular view. 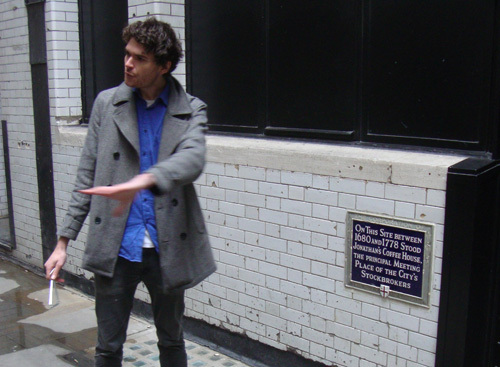 Holden’s work on the Underground is amazing, and it deserves all the credit it gets, but the truth is that Holden had a relatively easy time of it. OF COURSE Holden’s stations are great. OF COURSE they represent an excellent example of the Arts and Crafts movement’s principle that real things should be designed well. OF COURSE they did because Holden had the time, the luxury and – most importantly – the senior management support from the legendary Frank Pick that allowed him to make them that way. Yes he had plenty of issues, but fundamentally he was gifted a working environment in which he had a pretty easy path to success. Green, by contrast, had the exact opposite situation. 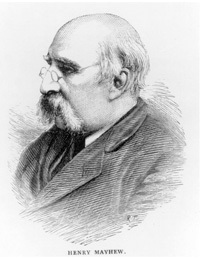 In Charles Tyson Yerkes, the epitome of the American “Railway Robber Baron”, Green found himself working for a man who wanted high art at low cost, who was pushing stations and lines forward at speeds that gave little regard to what was actually practical from an architect’s perspective, and who had no problem with sacking anyone who he felt wasn’t meeting his needs. People can be sniffy about Green’s stations all they want, but to produce anything close to quality architecture under those circumstances is an incredible testament to his ability. 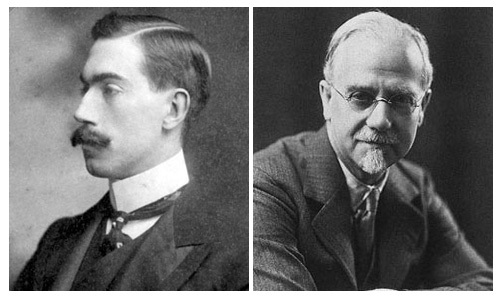 Holden produced beautiful stations because of his boss’ goals. Green produced beautiful stations DESPITE his boss’ goals. There’s almost something class-based about it I suppose (isn’t there always in Britain?). Holden’s stations, much as I love them, often leave me feeling slightly out of place. Unconsciously, I think Holden and Pick created distinctly “middle-class” stations – even in areas that resoundingly weren’t. I don’t mean that in a negative way, just that they feel like stations designed to gently, but politely, teach one to be a better person, but which gained the luxury to do so through a position of privilege of which they’re not innately aware. Green’s stations, on the other hand, feel like “working class” spaces (despite Green himself not being so). Stations that look good almost despite themselves – because the man on the spot doing them had pride in his work and maximized what he had at his disposal. Not perfect, and not to be fussed over, but something a man could be proud of nonetheless. If I stand in a Holden station and close my eyes, I hear the sound of architecture lectures, if I do the same in a Green station, I hear the sound of football crowds. Green’s stations feel like they worked hard at an inner city comprehensive to get to University, Holden’s feel like their parents could afford extra maths tuition on the side, just to make sure. 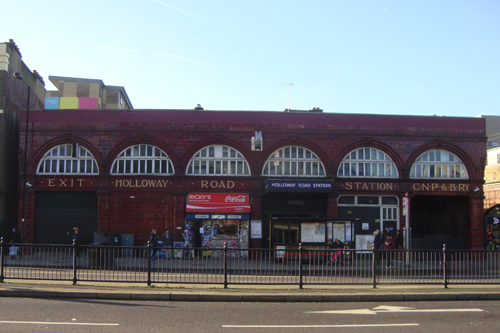 Holloway Road Station (1906) by Leslie Green. The most complete of his surviving stations. 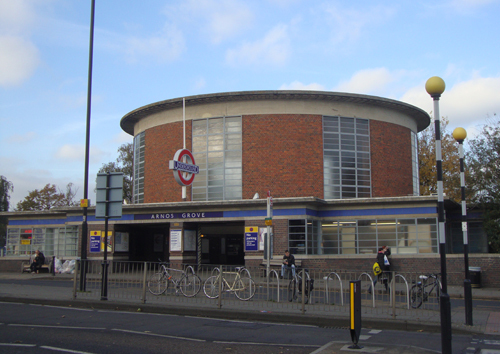 Arnos Grove Station (1932) by Charles Holden, considered by many to be his finest. 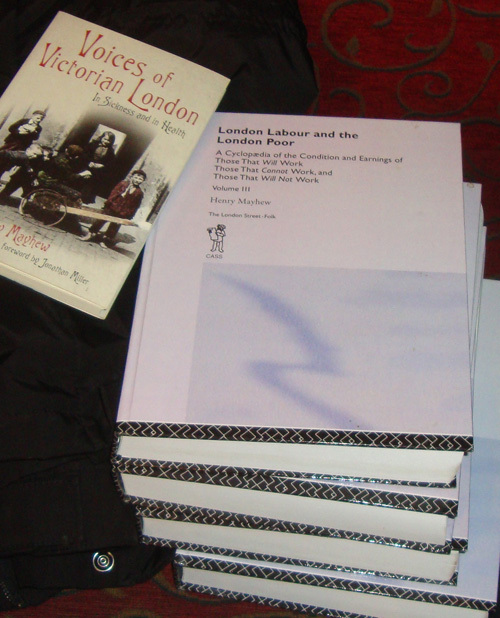 A guest post by London Historians member Ursula Jeffries. About a year ago Mike wrote on this blog about John Passmore Edwards, the nineteenth century philanthropist. 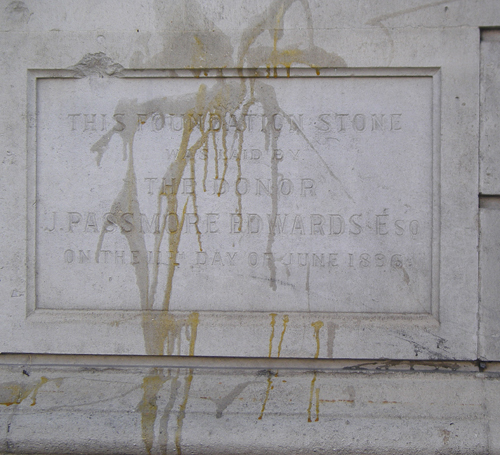 London Historian members who take an interest in his London legacy might like to know how the guardian of his memory is getting on. Dean Evans, author of Funding the Ladder which tells his story, has won an award from the Cornish publisher Holyer an Gof in their non-fiction section devoted to industry and heritage. Dean puts all proceeds from sales toward the fund to restore the Blackwater Institute near Hayle in Cornwall where Passmore Edwards began his quest for literacy for all. 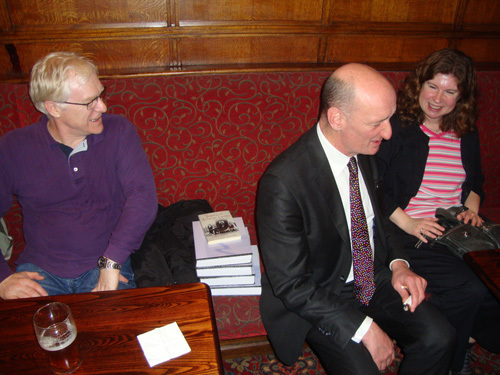 Raising money for any project is getting tougher but do look at the website dedicated to an almost obsessive supporter of libraries who left such a mark on London. 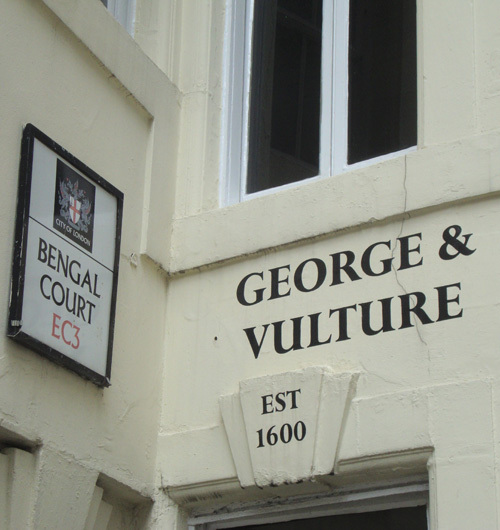 His name lives on in some buildings such as the facade of Whitechapel gallery but is receding with the closure of libraries and removal of many of his more utilitarian donations such as horse troughs and drinking fountains. The former Haggerston library, a stunning building, has been adapted into apartments. Here’s an image sent by a colleague which expresses how I feel about the loss of the resources he sponsored although I imagine if I were richer I would want to live there! P.S. 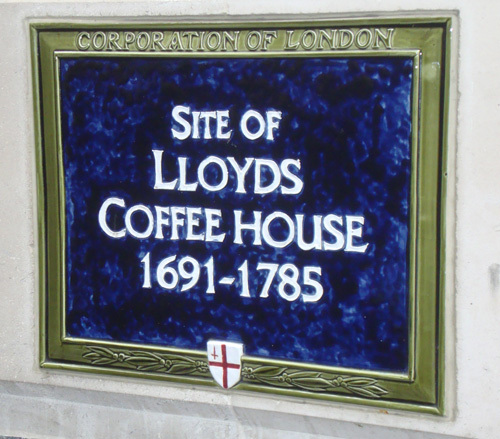 Do any London Historians have any other thoughts about Cornish legacies in London? In the nineteenth century many Cornishmen left the West Country to seek their fortune and as was the way in those times formed the London Cornish Association. Their annual dinner, founded in 1895, is still held, a tradition only suspended on one occasion when George VI died. 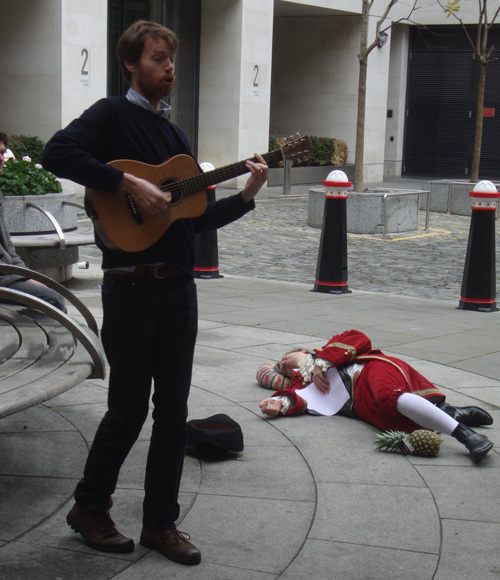 The LCA are producing a leaflet guiding their members and international visitors round London following a Cornish theme. The list, which includes Cornish gold and granite and Humphrey Davey at the Royal Institution is quite long already but all additional ideas are welcome. 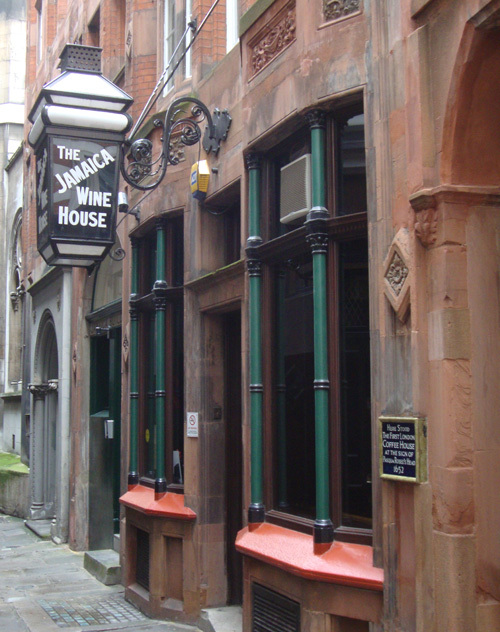 A guest post by Thomas Hood. 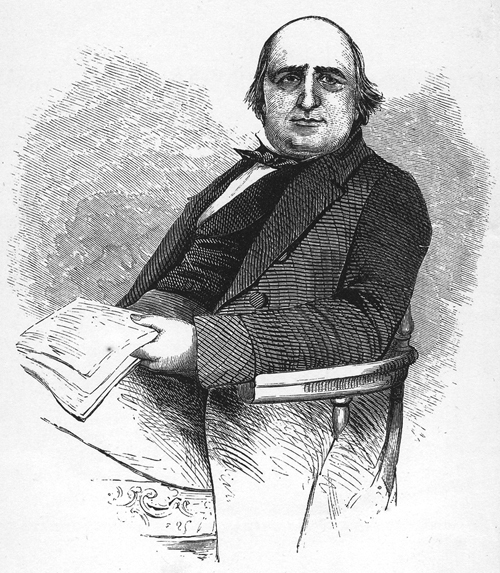 Thomas Hood (1799 – 1845) was a humorous writer, editor and poet. 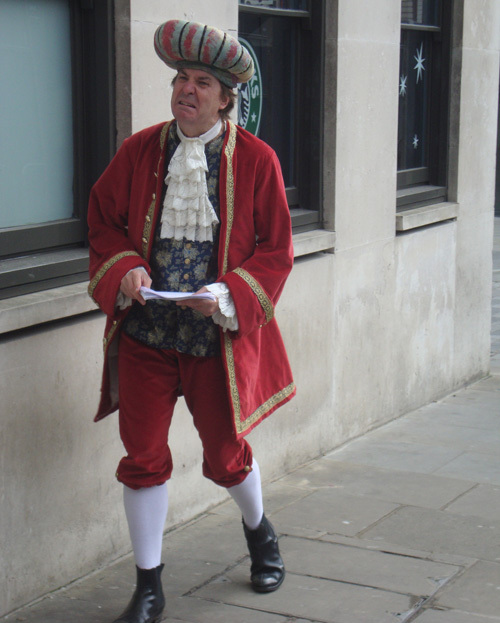 Born in the City of London, he was very much the patriotic Londoner. I’ve always enjoyed his pessimistic ode to this month, conveying an outlook I strongly share.